Surprise your favorite gourmet with the chef female blonde hair personalized Christmas ornament that arrives in our exclusive velvet gift bag. We letter by hand the name and year, if you want them included. 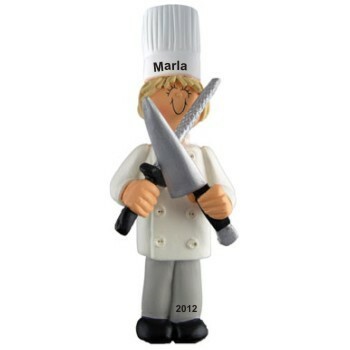 These chef ornaments personalized to be special mementos have an attractive cord, so the female chef with blonde hair personalized Christmas ornament can be quickly displayed wherever it looks the best. Oversized knife & sharpener Nov 18, 2014 Sophia P.